Mohan Rana is an Indian poet who has lived in Britain for over 20 years, but always writing in Hindi and, until recently, publishing his work only in the land of his youth and education. Our conversations for Bread and Salt are a fascinating exploration of the difficulties and the new perspectives that can be associated from such a relationship with languages. 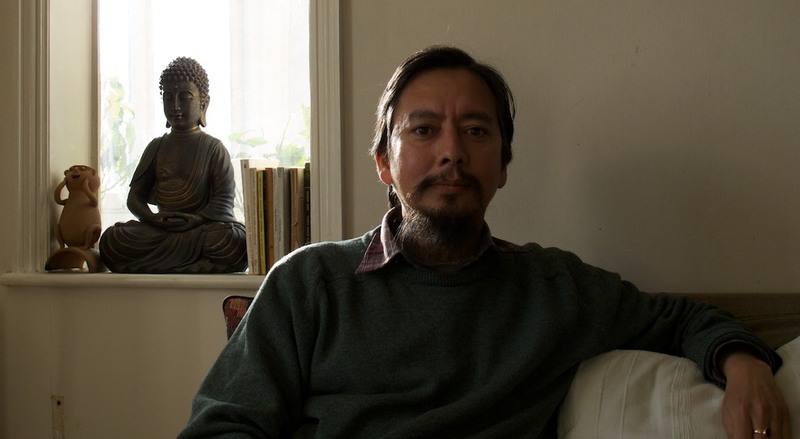 His poetry is admired in India but is almost invisible in the UK. The Poetry Translation Centre published a chapbook of his poems, translated by Bernard O’Donoghue and Lucy Rosenstein, but this is a tiny sample of his work. The Translation Centre’s website presents some of the poems in three versions: the original Hindi, in a literal translation and in a version by Bernard O’Donoghue. Even without being able to read, still less understand, the Hindi, the pages offer a tantalising glimpse into the instability of meaning. He used the image of being on the other side of a window. I imagined him speaking poetry from other side of a river, so that I don’t catch all the words and, even then, they are distorted by being called out. Mohan’s latest book was published on 29 August. It is called RET (Sand) kaa (of) PUL (bridge) so…’Bridge of Sand’. A short interview with Mohan appears on this website. The experiences and questions about language we have been exploring will be appear in Bread and Salt, which I hope to be able to complete and publish next spring. A majority of human beings speak at least two languages, albeit to widely different degrees. Because English (or as it is sometimes called ‘Globish’) is the leading language of international communication, especially among professionals, many native speakers don’t appreciate that their monolingual identity puts them in a world minority. Like Romans encountering Latin speakers in far-flung parts of the Empire, those who rely only on English may have a specially unreliable view of what the natives think. There is something deeper in this than understanding other people though, essential as that is. Anyone who has grown up in two languages, as I did, has a multiple sense of their experience and of reality itself. The word ‘table’ (English) is not the same as ‘table’ (French), though they seem identical and signify objects of comparable appearance and function. They just don’t mean the same thing because a French table is, in so many ways that articulate a culture, different from an English one. Developing a consciousness in two languages makes it much harder – for me, impossible – to hold a unitary interpretation of the world or to divide people into Greeks and Barbarians. Far from inspiring any pride in one’s knowledge, the ability to understand more than one language teaches humility in the face of incompatible but equally undeniable realities. Even if only reading the scraps of the scraps, translations of translation, something as strong as it is apparently imperceptible still remains In Mohan Rana´s poetry. The experiences journey is first noticed by Mohan from outside language finding its way through him into language. His mother tonge Hindi. Something becomes something: from an experience into a written form, from hindi to english, from Linguistic english to Poetic language. Even then, and in between, as if all along, without the proper shape or expected form, all along still depth, still force, still something silently grabbing, pulling, and stretching as a reader becomes a translation of himself in the experience of that poetry life evolving force. From one person to another and yet more translations as one reads, decides and deconstructs till it goes, if it can, to where it came from in the first place, through some body else. Leaving a trail of experiences. Having seeded its way around different grounds. Sometimes even finding fertil soil. Mohan Rana´s rana poetry is just like those god things in life everybody takes fro granted and only few value or even notice. In many levels, they are descriptive notes of a mistic daily life, as if sticky notes left for others to see. Quick pictures of experiences in his life journey through mysterious planes of common places. Mystic events, signs go traveling into napkins, forehands, books, computer screens… Like water finding its way back to the ocean it came from. And like water Mohan´s Rana poetry is valued only by some thirsty people and few other that can still tell the diference from other beverages or soda drinks. Until it may become bottled and made trendy to have mineral water or better if we start remembering how nothing is better than water to ease the thirst. Derrida wanted to look beyond the box of language, and Mohan is aware of the limitations of language in our experience. Nonetheless it is also aware it is the tool we got to comunicate, and uses language to go beyond language, to hint or sign towards a direction or some space in the experience of existence where the borders of language are blurry. The edges of human experience through language leaves space for something else language can only infere. Thanks for this interesting post on talks with Mohan Rana. I guess it would be nice to have a series of them. I am sure the echoes of the conversation will bring new understandings and new conversations, wich in turn… well you know… events of the ¨Rabbit Hole¨ or The spiral of life towards self remembering. Thanks for your comment; I’m glad you found this interesting. There will be more on these issues over the coming months, before the completion of the project. The book, ‘Bread and Salt’ will also be available to download from this site some time next spring. mohan rana is a college days friend.i have been reading him since then.his poems reflect his personality and interval happenings.his perception of nature and intricacies of human relations is rather abstract.the poems deal with mind space and a citizen divided between two cultures. I like Mohan’s poems very much!